On the evening of Tuesday November 21, the Navy League of Canada hosted their annual cocktail reception in Canada’s capital. The setting was the newly renovated Sir John A. Macdonald building directly across from the Parliament Buildings. The close proximity to the House of Commons was by design as this event is intended to showcase the Royal Canadian Navy and the Canadian Coast Guard to Canada’s elected officials. 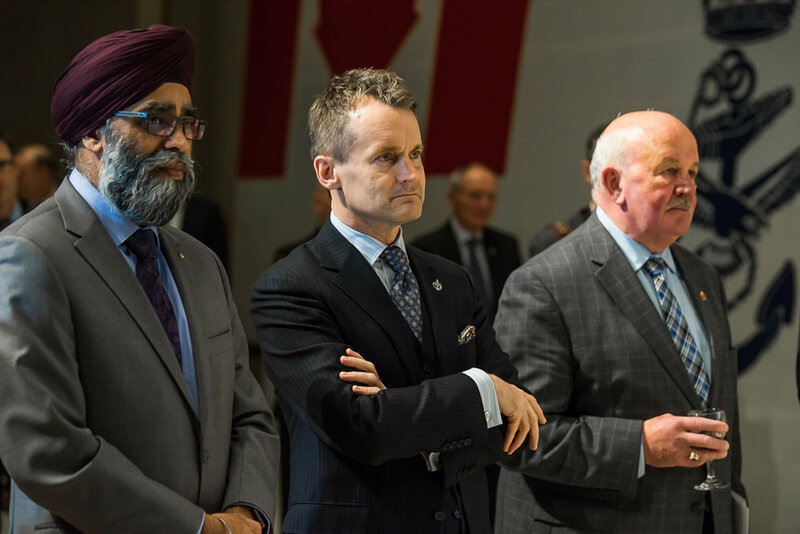 In attendance were well over 400 guests, including Members of Parliament and the Senate, along with the senior RCN and CCG brass, defence industry executives and a number of representatives from Veterans' organizations. Speakers for the evening included event host, Captain (Ret'd) Harry Harsch, RCN, Vice-President of Maritime Affairs, Mr. Earle Corn National President of The Navy League of Canada, Rosemary Chapdelaine, Vice-President Lockheed Martin Canada, Minister of National Defence The Honourable Harjit Sajjan, Speaker of the House of Commons Mr. Geoff Regan, Minister of Fisheries, Oceans and the Canadian Coast Guard The Honourable Dominic LeBlanc, Commissioner of the Canadian Coast Guard Jeff Hutchinson, Commander of the Royal Canadian Navy Vice-Admiral Ron Lloyd (who also presented the first Sea Cadet Centennial Pin to the Top Sea Cadet of the year CPO1 Maude Maisonneuve to officially launch the Centenary year of Sea Cadets in Canada), and Senator Terry Mercer. Other notable MP’s present included Veterans’ Affairs Minister The Honourable Seamus O’Reagan, Parliamentary Secretary, Global Affairs Canada Andrew Leslie, plus the Honourable Karen McCrimmon, Elizabeth May, Cheryl Gallant, Joyce Murray, Randall Garrison and the Honourable Peter Kent. Joining Vice-Admiral Lloyd was RCN Deputy Commander Rear-Admiral Gilles Couturier, MARPAC Commander Rear-Admiral Art MacDonald and MARLANT Commander Rear-Admiral Craig Baines, along with a number of Honorary Captains (N). The exquisite selection of appetizers was provided by Ottawa’s foremost caterer Thyme & Again, with Big Rig Brewery generously supplying a steady flow of free beer. In between speeches, a string quartet from the Canadian Armed Forces Central Band kept guests entertained. The highlight of the night was a video montage of the RCN in action over the previous year. All in all, a great event to showcase two of Canada’s finest institutions – the RCN and the CCG.